Allows precise, repeatable drilling of multiple hinge cup holes—no drill press required! If you're drilling hinge cup holes for multiple doors of the same height, the JIG IT Deluxe Concealed Hinge Drilling System will save you loads of time. 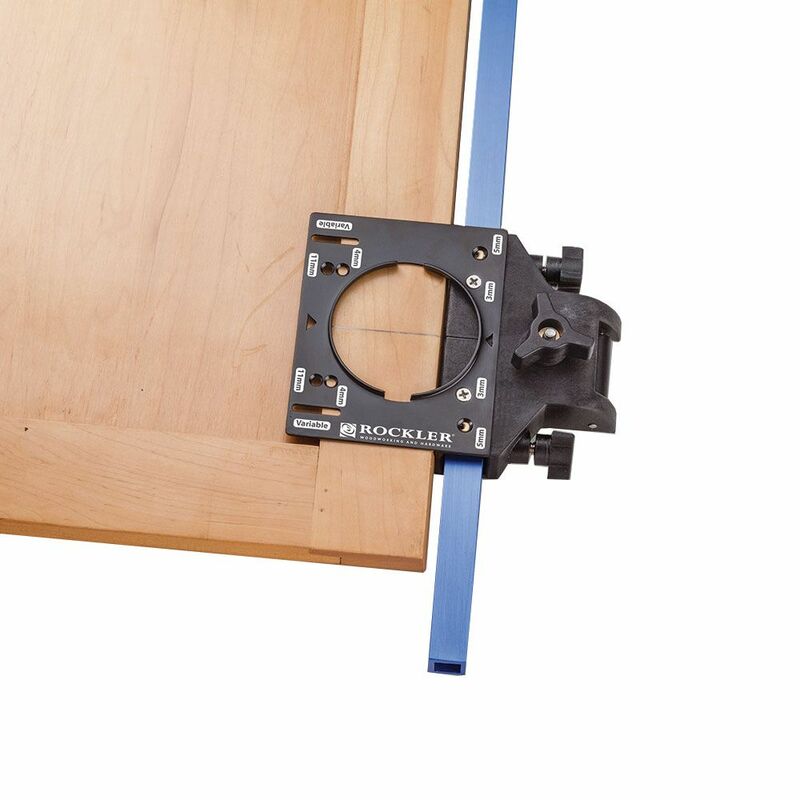 The system comes with a sturdy 36'' aluminum rail and two hinge cup drilling guides that slide along the rail to align with your hinge plates. Once set up, you can use the stop block against the top or bottom of each door to achieve identical results throughout any bank of cabinets. With no need for a drill press, you'll save both money and shop space. Each guide features an integral spring clamp that requires no adjustment, and holds the guide in place as you drill. 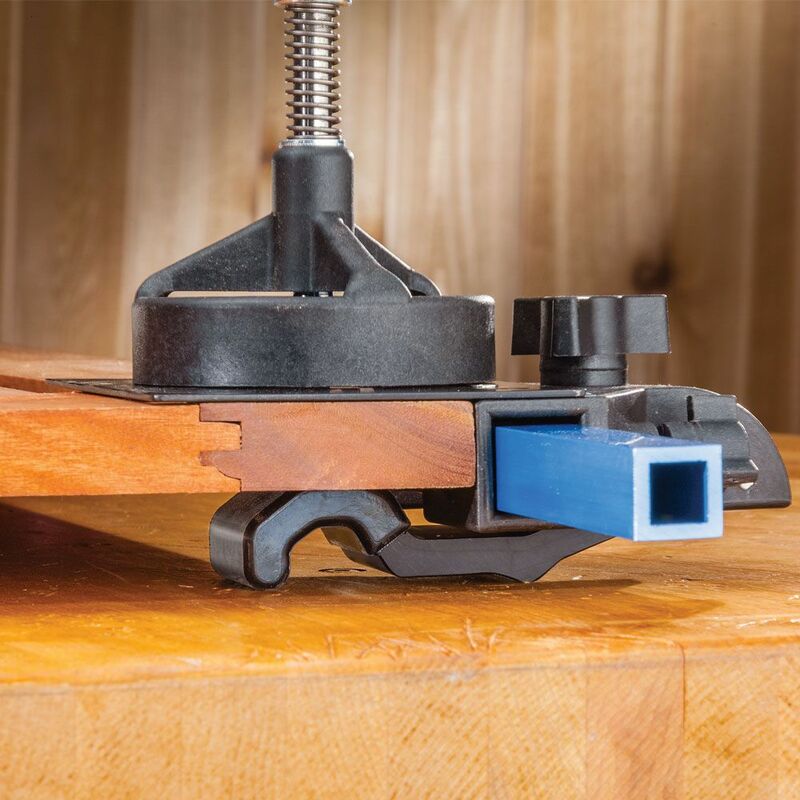 The clamp also doubles as a foot that rests on your benchtop (or the floor) and provides firm support as you apply downward pressure with the drill bit. To support the outer edge of the door, simply use scrap blocks or Bench Cookies (sold separately). 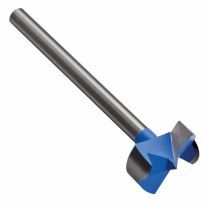 A long shank Forstner bit (sold separately) to match your hinge cup size is required to use the jig. Carbide bits are recommended. 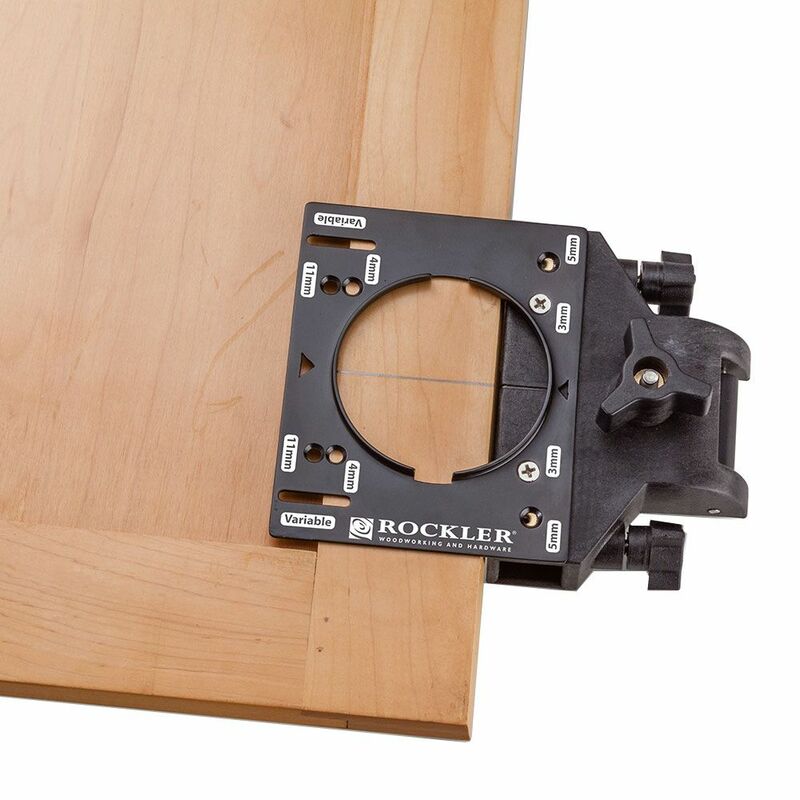 For fast and accurate installation of the cabinet plates from two-part Euro-style hinges, check out Rockler's lineup of JIG IT® Hinge Plate Templates. Available for many hinges, they make it easy to drill precisely spaced mounting holes in the cabinet. For tall doors requiring three hinges, an additional Concealed Hinge Drilling Guide (56778) can be purchased separately and added to the rail. Excellent. 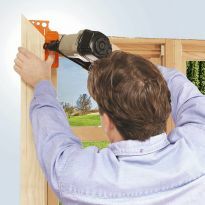 A must have for installing hinges. Makes life easier. Fast and accurate. Easy to set. The Jig-iT rig is excellent. We make jigs for many repetitive operations in the shop or on the jobsite. We ordered this one due to varied sized doors on the cabinets we made for a project. We installed Salice compact self closing hinges and this project had to be perfect the first time. I did a couple test drills on scrap wood and then proceeded to drill all hundred or so hinge holes. Every one was perfect and I had all the doors ready for hinges within an hour. It is intuitive to use once you see the jig. 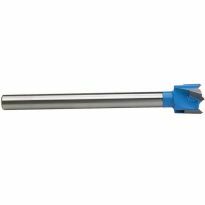 Do yourself a big favor and buy the optional 35mm by 4 inch shank forstner bit. It's not really optional, the job would be a nightmare without it. Th jig can not be properly operated without the bit unless you make a jig to fit in the Jig-iT holes. Be sure to find out the tab of the hinges you're using before drilling and adjust as needed. I have over 40 yrs experience at woodworking, and this jig was the easiest I have ever used or even seen once I had it set up. I had the older jig it concealed hing drilling system which was great but this one is even better. I have finished a number of cabinet doors with the older version with great results but the new version is superior. Works as advertised! Not for reverse beveled Doors. The jig worked great! I tried on just one door which made me realize that European concealed hinges woul not work on a reverse bevel door style. When I returned the hinges the salesman confirmed my assessment. I don’t know if they will take it back now that it is used. 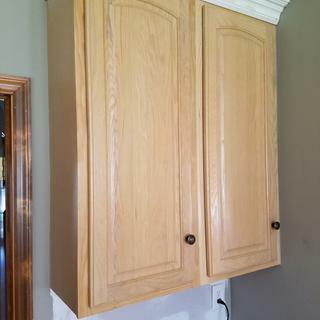 I recently replaced the cabinet doors in the kitchen. Twelve of them were the same length and four a little smaller. Setting the bore hole placement using this jig was easy and made light work of drilling the 32 holes required for hinges. 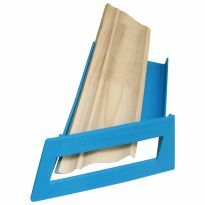 Materials and construction are top quality and this jig is built to last long after repeated use. I highly recommend it. Of all the things I’ve purchased from Rockler? This one was the best. This lines up hinges one-two-three, takes almost no time to adjust, and the set up is almost intuitive. If you’re going to do a lot of cabinet doors like I did? Same yourself the aggravation and buy this device. I was a little worried about drilling into the back of my cabinets. I reviewed several jigs but decided that having the bar and being able to set the position on one and then have a complete duplicate position on similar doors was the way to go. And, I think I made a good call. My wife is delighted with the results. Good jig with the right bit! Great little jig for drilling doors. Make sure you buy the bit to drill, its not in the box. DO NOT buy the high speed steel bit. It is designed wrong for this applicarion and does not cut at all. The carbide tipped bit is what you want. Exactly what I wanted. Wow! Easy to set up and instructions on use were pretty good. 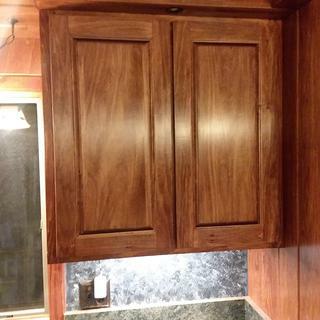 I used for remodeling older cabinets with exposed hinges. Biggest complaint is not really the Jig-It system itself. However, the Jig-It instructions state that users should review the directions in the separately purchased hinges for depth, etc. 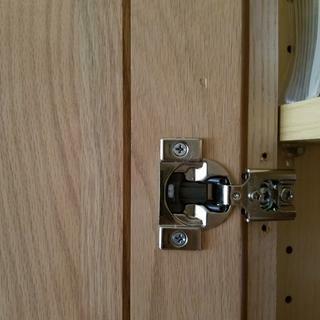 The Blum hinges (also purchased at a Rockler store), though, contain no such directions. Very frustrating. The Rockler website was not user friendly in trying to obtain the needed information, but the folks at the local Rockler store were very helpful despite this. Overall, very pleased wiht the product and would recommend. I have used this jig on a few projects now, and it is a solid unit that improves speed in accuracy. Well worth the money. I have never attempted any type of cabinet finish and this jig easy to use. This jig makes my work much easier, I was doing everything manually which takes very long for the set up on my drill press. I bought this jig so that I could bore the cup hing holes on site to in the same exact position as the existing hinges. The hinges are a pain to pull out without damaging the cabinet box and besides they are in good shape. The first few holes I bored took a bit of getting used to it. It'll never be like doing it on my shop floor drill press...but after a while I begun to get assembly line like speed. Kinda pricey but great jig. Also having two base plates in a bar avoids erors and one pencil line is enough. I would wiggle my Milwaukee Cordless drill at the start to go past the harder melamine laminate faster and then plunge straight down into the MDF leaning on it with my body weight. I thoroughly enjoyed using this jig. I make most of my jigs myself, but this one... I love it. The jig is very easy to use and well built. With 34 doors to duplicate, the JIG IT is indispensable. 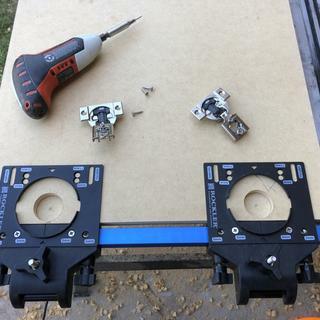 I am using the original cabinet carcasses and needed to exactly duplicate the existing euro style 35 mm hinge mounting holes from the original doors to the new ones. By setting the JIG IT to the original doors, I am able to exactly place the new mounting holes on the new doors. With 18 doors to go, I have yet to make a mistake. I would highly recommend this product with the long shank 35 mm drill bit. It has saved me hours of measuring and hoping to get it right. I thought European hinges were far too complex for me. I bought this jug to conquer my fear. Turns out it is far easier than I thought. Just line up the jug, drill with your 35mm forstner bit and you are good to go. There are many interesting options for European hinges, and they are so easy to adjust with installation that I now prefer them to regular hinges. This made a tedious job VERY easy. I made new doors for the entire house and drilled all the holes in a couple hours. They came out perfect. This is well worth the money to avoid ruining a door. Exactly what I wanted for the job at hand. Easy to set up, performs better than I expected, and quick! 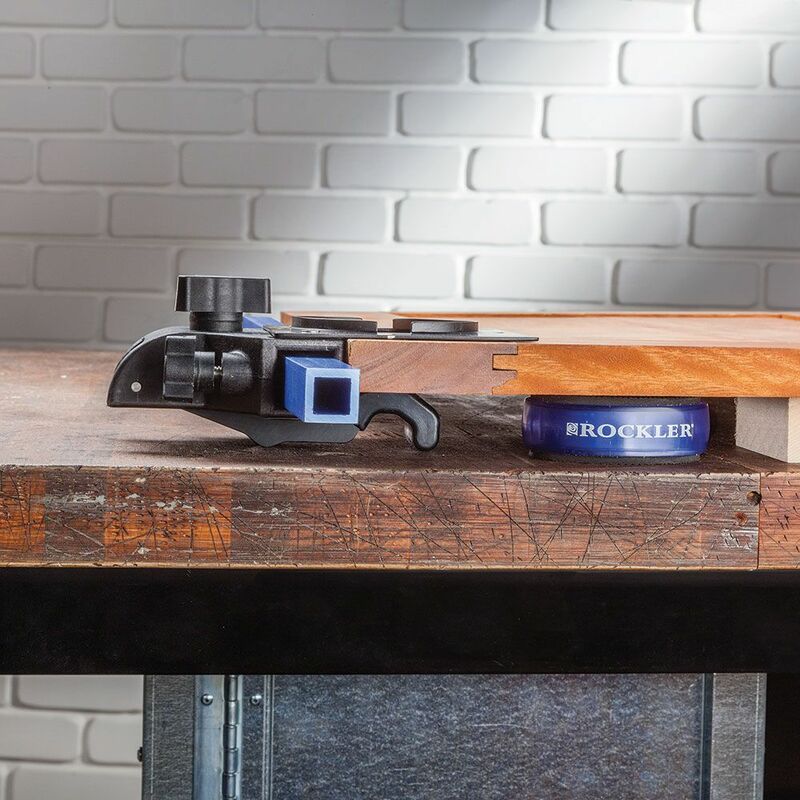 This jig saves so much time, and makes multiple doors a snap. I set the jig up for left handed doors and did all of them, and then set up for the right handed doors. It was so much better than working with one cup at a time. Saves lots of time. Worked great for cabinet doors. Set up was simple and the doors look great. Have been avoiding trying to use recessed hinges but not anymore. New to using Euro type hinges, this jig worked out of the box exactly as promised. I was just a touch disappointed in the fact that ONLY a Rockler bit will work with it, but other than that, my hinges fit perfectly, and the job looks great. Very easy to assemble and easier to use. A must have for a reasonable price. Quality product. The jig was absolutely essential for drilling the cups in my cabinet doors. I had 23 doors to do and there was no way I was going to do them all free hand (I don't own a drill press). The jig makes it super easy to lock in the cup location for each door, even after swapping out doors. The clamps secure the door perfectly without damaging the wood or paint. The aluminum bar and tough plastics ensure the jig doesn't flex or bend or introduce "slop" in your measurements. Great construction, thoughtful design, good engineering. A+ would highly recommend if you're doing more than a handful of doors. This jig made installing euro hinge to my cabinets so easy, It is a little pricy but totally worth it. Even beginners can install euro hinges like a pro. Forstener bit have to purchased separatedly. wasn't going to buy this. now that I have tried it, I wouldn't do it any other way. great time saver. Excellent for drilling holes. Makes it easily done with a hand drill. It has saved me a lot of layout time. Rockler Jig It Deluxe concealled hing drilling sysem. I purchased the Jig It as I am starting to build cabinets and wanted everything uniform. This was sent promptly and everything that was supposed to be there was included along with usage directions that were simple and user friendly. My first two doors turned out exactly the way I wanted them and am now looking forward to the next doors. Great piece of equipment and would recommend this to anybody. I could not even imagine trying to install these hinges without this tool and the corresponding drill template for the cabinet side. I am sorry that it hasn't been used yet but will be put to good use after the first of the year. The product appears to be very well constructed and should work quite well. You can almost throw away your tape measure. Great tool, once you set it up you can move from door to door and never use your tape measure. Planning to build several cabinets with concealed hinges. To make the job easier and more professional. I wanted to start using concealed hinges and the videos I've been watching had one of these to make drilling the holes a snap. Going to try and redo our existing cabinets. Stumpy Nubs made me order this. Recommended with good reviews. I have many doors to do, hopefully this will speed up he process. I'm building cabinets. Hopefully, this will help me with the cabinet doors. I make a lot of doors and want an accurate hinge system. I have a jig that I have used for years but it only does one hinge at a time. 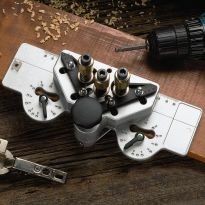 This should make hinge installation faster and easier as well as more accurate and it is less than a drill press jig would cost and I do not install that many. Doing a number of kitchen renovations as well as other storage plans for my house, and this jig will/should help speed up the process and make it easier to complete the job. I will be building a cabinet which will use European hidden hinges. I also have a cabinet door to repair. I’m working on a kitchen remodel and I wanted a jig that I didn’t have to set for each hinge. To make the doors identicle. Installing new hinges in all kitchen cabinets , this will speed up the process and be much more accurate. Building kitchen cabinets with all the same hinges and wanted repeatable results. 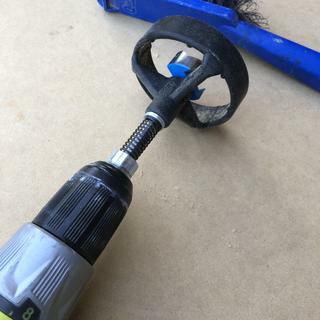 I have a friend that has this item and it is a perfect shop tool if you’re building cabinets. I’m in the process of building cabinets for my shop. Lost my job... and I'm venturing into possibilities of making kitchen cabinets etc..
Planning to convert old cabinet hinges to concealed hinges in kitchen. I need to bore some hinges and this product had some good reviews. I build a lot of doors, I'm excited to see how much time I'll have on setting up the hinges. 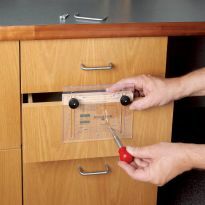 The best diy choice of jig for drilling multiple kitchen cabinet doors for concealed hinges. Home Project now, and future anticipated projects. Nice jig to install hinges easier and precise. Hi, I got the jig it deluxe concealed hinge drilling system. How do the holes in the guide (3-4-5-11mm) compare to the hinges that say 3/8 1/2 3/4" overlay...? Thank you! BEST ANSWER: The numbers on the guide are indicators to the tab. The tab is the amount of material between the edge of the door and the start of the hinge pocket. For the compact hinges it is usually 3 mm. Make sure you check the instructions for the hinges before you start. Thank you. Where will it list the correct mm? I don't see it listed anywhere on the hinge packages. Can this jig work for a 40mm cup, 1 5/8" thick door? I cut a finger pull edge in to my doors with the Freud 99-065. When the template is set to 3mm, my template cut is going to make the hinge be visible from the outside perimeter of the door. Do I just need to step the jig in farther to 5mm or some other metric ammount? (wish it was a fraction) Or will that affect how the hinge operates? BEST ANSWER: I am not an expert but have experienced a similar situation. I routered an ogee profile around my doors and the hinge hole cut thru. I just shallowed the router bit depth up a little. Maybe you could adjust you finger pull cut. If you change the tab mm your door overlay will change. Bought the 1/4 size bit and use the same size indexing pins. I put mine n 5mm or 1/4 inch from edge. It works great. Hope this helps. 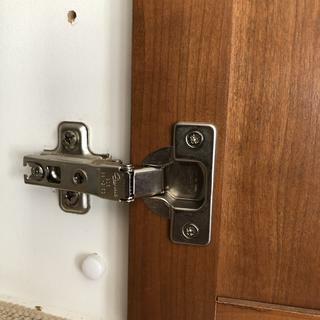 Can you use thes hinges on a face Frame cabinet with doors that have a 3/8" overlay? BEST ANSWER: I believe that you can use it for making inlay and overlay doors of any reasonable offset. I have not tried it with this yet, but am getting closer to using it. I am planning on making some doors with 3/4" overlay. i think what you're trying to ask is if the jig works with 3/8" overlay hinges. The answer is yes. It works with pretty much any cup style hinge. 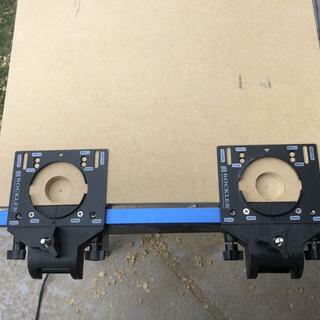 The cup hole can be adjusted on the jig for various overlays. Yes. that is the size of the overlay on my kitchen cabinet doors. with the forstner bit you get a good clean hole. other size overlays can be made also. 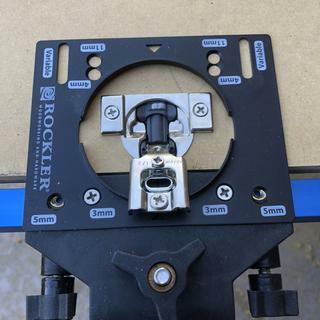 Will any 35 mm bit work in this jig or do we have to buy Rockler's bit? The shank isn't long enough on a regular bit, otherwise it would be OK. I have two questions. Will this jig grip cabinet doors that have a finger pull routed on the edges? My doors are 3/8" overlay but the finger pull edge changes that dimension to 5/8". Can this jig accommodate that 1/4" adjustment? BEST ANSWER: Hi, yes, I own this jig and it has preset adjustments from 3mm to 11mm and even a free range slot adjustment for variables in between. Love this jig!!! Yes, it's a pivoting arm that self adjusts to grip in the middle of the material. 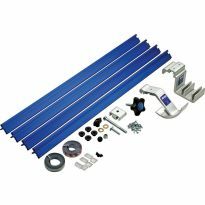 The instructions state "For doors requiring more than two hinges, single Jig It Concealed Hinge Drilling Guides (58605, sold separately) can be added to the system." Where can I find that product? does it come with the bit ? BEST ANSWER: Make you sure you get these two measurements right: shank diameter (3/8") AND bit head size for hinge cup (usually 35mm). The diagram to the system is a bit misleading. It points to the head as being 3/8" when it should show two measures: one to the shank diameter and a second to the bit head size. This is a great jig, but it did not come with a bit. I was fine with this decision by the Jig It team as I tend to spend more money on bit to help get a clean cut than most companies would have included in a kit. No, it does not. You may use different bits for different brand hinges. The prosuct works excellently, but the bit is not included. No it does not. Be sure to get a long shank bit. The jig can be used to mark the hinges plates location on the cabinet side too? BEST ANSWER: I didn't use the jig for that purpose as I used the jig to drill all the holes for the hinges in the doors and found the holes very precise in the 50+ doors I made. I found locating the hinges on the cabinets was a snap to just use a combination square to mark the desired location of the hinge. I hope this will help you. This is a Drilling jig, not a marking jig, but it will work on either side of the door. The aluminum rail is 36." My doors are 38.5." If I want the center point of my hinge cup 3" from the door top and bottom, will the rail be long enough to secure both guides? Or do I need to purchase a longer rail? BEST ANSWER: I did not get this out and measure it but will say you could just move the end stop to the opposite end after drilling the first cup. You don't have to cut both cups at a time. Unless you have a lot of long doors i wouldn't spend much money for a longer rail. I bought a 48" piece of square aluminum tubing at HD. 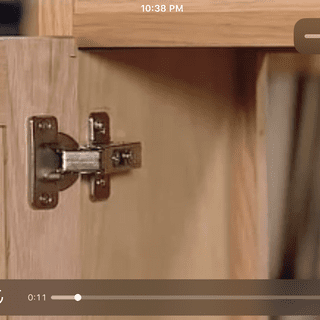 Will this jig work for Blum hinges? BEST ANSWER: IT works fine but don't forget to buy the Forstner bit that goes with it. I had to buy it after noticing it was not inclused. Buy it from Rockler. Yes, it works great. You have to buy the forstner bit separately,though. Would this work with 5/8" depth doors? Would this hold the wood firm enough since it isn't 3/4"? BEST ANSWER: Yes the Jig Will clamp down on half-inch material so I think it will work fine on 5/8"
What length shank will you need to use in order for it to fit in the jig? BEST ANSWER: My bit measures just under 5". I ordered it by description. It was listed as a long shank Forstner bit. How does locate the holes on the cabinet side? BEST ANSWER: It doesn't. It locates the location of the hinges on the cabinet door, and does a very good job of it. The jig it hinge template A does a good pretty good job, however some measuring is still required. 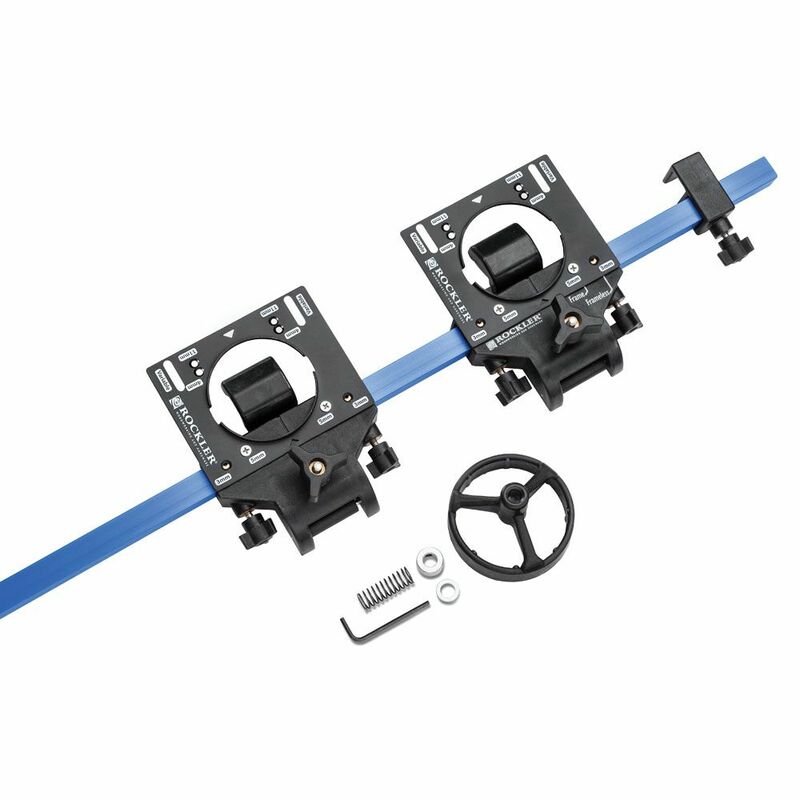 does the Jig It hinge plate template come with a 3/8 stop collar ? I am making 40" completely inset raised panel cabinet doors. 2 1/8" stiles. Will this jug extend over the 40" height? Can I use a 35 mm Forstner bit? Will there be a problem with cutting through the bead? Thank you Gerald. Is this a useful jig? Any problemwith the depth of the cup hole going through the standard bead on the stile? Will this jig work on Bi-fold doors also? BEST ANSWER: Some bi-fold doors are hollow. If so, this type hole wouldn't hold. If solid, may work. Inspect h8nged edge to b sure first. for a full overlay door and a frameless cabinet which jig is used for the cabinet holes? BEST ANSWER: Frist you need the correct euro hinge. From here all you need is the tab setting for your hinge and set the concealed hinge drilling system (drill cups set up). The short answer is yes it can be used. Will the jig fit on 5/4 stock wood? BEST ANSWER: I see no problem. used 2 pieces of 3/4" stock together and they fit without any difficulty. So that was 1.5". What about guides for the tab holes on either side of the 35mm pocket? will this do the bi fold door in a corner cabinet where you have to cut hole a little bit off the door? Does this jig have the offset for lazy Susan offset cup hole that cuts out the side of the door for the bifold hinge? Can I purchase the spring hardware set only that comes with the jig it hinge drilling system?